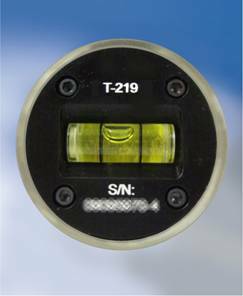 Hamar Laser’s T-219 2-Axis FrontMount Bore Target is designed to work with bore adapters for small bore applications, where the target needs to be mounted at the far end of the bore. 10x10 mm PSD (Position Sensing Detector) is mounted as close as possible to the front of the target, minimizing bore offset errors caused by the target not being mounted inside the bore. 2.000" OD, with stainless steel ground and hardened surface. Accommodates bores down to 0.5" (12.7 mm). Small and compact, with a removable cable for easy storage. Spirit level orients the PSD sensor axes to the alignment axes of the bore.